Devonshire Park has long been an Eastbourne attraction. It was originally designed in 1874 as a terrace, with walks and a cricket ground. The first tennis courts were laid out in 1880 and the Devonshire Park Theatre opened in 1884, followed by the Winter Garden a year later. The exotic Indian Pavilion, which opened in 1891, was taken down to make way for the Congress Theatre in 1963. This 1,650 seat theatre is the largest on the south coast. Architecturally it is judged to be on a par with the Royal Festival Hall and the National Theatre on London’s South Bank and is now a Grade II* listed building. But that was then. The Congress closed its doors in January 2017 to become a major part of the town’s £54million project to create the new Devonshire Quarter. Regarded as one of the most complex redevelopments in the history of UK theatre, the Congress reopened on 24 March 2019 with a sold-out concert by the London Philharmonic Orchestra. The project has been praised for the way in which architects Levitt Bernstein worked with the listed fabric of the building. The aim throughout has been to restore and improve the theatre whilst at the same time making it more energy efficient. New flooring, seats, ceilings, lifts and toilets have been installed together with new heating and air conditioning systems and a state-of-the-art lighting bridge. The Congress will take its place, alongside the Devonshire Park Theatre and the Winter Garden, as part of the biggest public sector cultural investment in the southeast. The new Welcome Building will provide a clearer link to both the town centre and the seafront via a newly created public plaza. It will house a central box office, conference halls, hospitality areas with lifts to all floors. 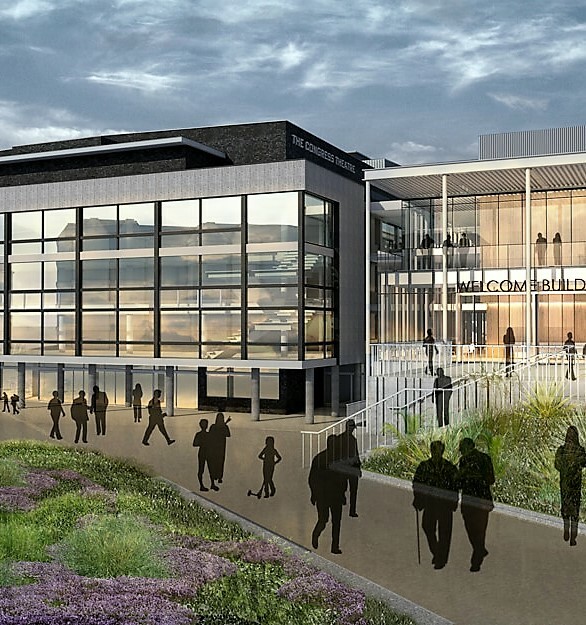 This will provide access not only to the theatres and the new tennis facilities but also to Towner, with its world-class exhibitions of contemporary art. The Devonshire Quarter looks set to become a major cultural, conferencing and sporting complex and it’s all right here in Meads.